Aerodynamic design could be the key to top cycling performance - so why do the racing bikes we see competing in the Olympics look like everyday bicycles? Glen Thompson, Senior Lecturer in Mechanical Engineering and Design, explores the barriers preventing technological advancements in cycling. It’s the study of airflow over and around a surface. Children usually first understand the forces of air when they stick their hand out of the window of a moving car - they feel the force of drag and lift when rotating their hand horizontal to vertical, a magical playful moment of feeling physics. Understanding how shapes and dimensions of objects, or the aerodynamics, can reduce the resistance of air and reduce drag is the key fact in understanding how things go faster. The same is true of course for cycling, and competitive cycling in particular – which is now a huge part of the modern Olympics. Even the average cyclist is aware of this on a flat road with no wind, as they reach 18 mph 90 per cent of their power output is used to overcome the force of air, as you go faster you start to realise that air is thick stuff. Why has the bicycle not advanced? A key question to ask when we have so much technology at our fingertips is, ‘Why do racing bikes look almost the same as a standard model?’ Why don’t we see track bikes with aerodynamic foils, wing-like handle bars and almost flat one piece monocoques frames? Regulations make it difficult for designers and engineers to develop more aerodynamic designs as UCI wants to ensure that athletes are the stars, not the bicycles, and that everyone is competing on a level playing field. This regulative approach has been in place since the 1930s, making the event more about the limits of human performance rather than the limits of design. Where would we be if we had gone with a design-centred approach? 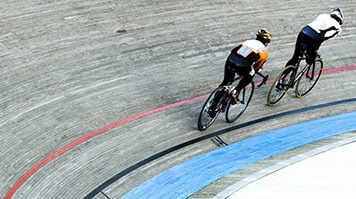 There’s one particularly defining Olympic games where cycling had major developments in a bicycle. At the 1992 Olympics, Mike Burrows' unique Lotus Type 108 bicycle enabled Chris Boardman to set new world record of 4 minutes 24.496 seconds and win the gold medal for 4000 km pursuit. The Norfolk based designer and rider created the revolutionary frame, utilising carbon fibre mouldings to create an advanced aerofoil cross-section using a carbon composite monocoque. The UCI went on to ban monocoques, putting the brakes on further creative and innovative work for an ultimate aerodynamic bicycle - reverting those competing in profession cycling events back to a standard double diamond frame composition. Regulations have in some respects halted the development of the bicycle, which has a negative impact on the amount of time spent on engineering better and more efficient bikes. As a designer I have felt certain frustrations in trying to design a bicycle within the current UCI rules, as there is no scope for new idea or innovation. We have grown so much technologically; it’s unfortunate that we can’t presently create a better and more advanced version of the original double diamond framed bicycle for competitive sport. Glen Thompson is a researcher in Fluid Dynamics – he’s currently attempting to build a record-breaking Human Powered Vehicle.